Let me put my cards on the table. This CD contains some of the greatest, the loveliest and the most moving music I have ever heard. And all this from a composer who is hardly a household name outside his native Sweden. In fact, I doubt many folk will have ever heard of him, never mind be acquainted with his music. Now I am fortunate and have listened to a number of his pieces. I was aware of the three works on this disc but never had the opportunity of hearing them. The problem is further exacerbated by availability: a brief look at the Arkiv catalogue reveals only one work by Nystroem - Partita for Flute, Strings and Harp. I know there is another one of his songs on the Musica Sveciae label. So why my enthusiasm for this unknown or little known Swedish composer? Even a brief perusal of the Songs of the Sea will reveal a work that is every bit as fine as Wagner�s Wesendonck Lieder or Richard Strauss�s Four Last Songs. And for me that is saying a lot. Those Wagner offerings are the only pieces by that composer that really move me and that is not saying I do not rate, like or appreciate him! These songs, third �marine� work on this CD, are extremely lyrical. Chronologically they came between Nystroem�s heavier seascapes. Not that the Songs of the Sea are not passionate � they are. This music is full of the light and colour and feel of the Scandinavian coastal land and seascapes. This is not really impressionism as such � just wonderful settings of words to a fine vocal line. This is coupled with superb orchestration that evokes the mood of the words. I have noted below that the composer was also an artist � and perhaps this accounts for much of the texture and hues. Every note of this beautiful set of five songs tells; nothing is out of place. Carried on the foam of the surf. To talk with him of someone who is dead. These songs can be summed up as ranging from �sunlit archipelago to shaded beaches and from turbulence to consolation.� The singing by Charlotte Hellekant is divine. She has a stunning voice that deserves to be heard more widely. Apparently she has already recorded the Songs by the Sea in its voice and piano version on Daphne Records 1019. A brief résumé of Gösta Nystroem�s career may not be out of place here. I lean heavily on the Swedish Music Centre�s biography. The basic facts are that he was born in Silvberg, Dalarna on 13th October 1890. He studied music at the Stockholm Conservatory just before the First World War. This was followed with further tuition from Andreas Hallén, a notable Swedish composer. His education was rounded off in Copenhagen with lessons from d'Indy, amongst others. It was at this time that he started to study painting in earnest. After thirteen years in Paris he returned to Sweden where he lived until his death at Varberg on 9th August 1966. Aside from composing he was a music critic for a major newspaper in Gothenburg and spent time as Director of the Gothenburg Art Association. If all this is not enough he was an accomplished pianist and had a fine baritone voice to boot. I also understand that he was poet. The composer wrote an autobiography called �All I remember is pleasure and Light�. However it is fair to say that his music does not necessarily mirror this. It is known that Nystroem had an extremely serious side that bordered on the melancholy. And this was manifested in many of his compositions. He was not only impressed by landscapes and seascapes - there was a deeply spiritual side to his nature. This revealed itself in sensitive and sometimes intense melodies which have a rhythmic vitality that exudes energy and dynamism. Yet much of his music is reflective; there are moments of peace and tranquillity that well balance the more lively aspects of his craft. Nystroem was largely a �tonal� composer but also made use of a considerable array of compositional tools. As for reference points to help the listener decide whether Nystroem is for them, it is very difficult. I thought about Gustav Holst when I was listening to some of this music. Perhaps Debussy is the obvious comparison for the women's voices in The Tempest. Some critics have heard the influences of Hindemith, Stravinsky and �Les Six.� Something must have rubbed off on the Paris sojourn, after all. And what about Arnold Bax � are there not hints of Tintagel amongst the sea-spray of The Tempest? But it seems to me that we have to take Nystroem as he is. He is actually unique; he does not slavishly follow any particular school. Perhaps, as we hear more of his music (hopefully) it will be possible to make an educated stylistic judgement on his works. The Prelude to the Tempest was composed in 1934. It was part of a suite of projected incidental music for the play. Three Songs were later excerpted from the score and have become well known in Sweden as a separate entity. A great chord opens the Prelude and we are plunged headlong into the storm. Of course The Tempest has generated a lot of music � I am thinking of Tchaikovsky and more appropriately William Alwyn. This present storm rages and to highlight the violence of nature Nystroem makes considerable and effective use of brass. Suddenly the women�s voices appear as if from nowhere � and this is where Debussy is recalled. These are obviously �sirens� trying to distract the sailors� attention. All the aspects of a storm are vividly portrayed - the intensity and even the false easing off. A lovely tune tries and fails to establish itself before being whipped away into the darkness. The storm reasserts itself and soon we are heading towards the end of the piece. Of course Nystroem shuts down the music and there is a tenuous calm in the closing pages. However I really do doubt if we ever get a glimpse of the Prospero�s Magic Island. Apparently this Prelude harks back to an earlier tone poem called The Arctic Ocean (what I would give to hear this work!) and this in turn was based on discarded sketches for a nineteen-twenties ballet project. 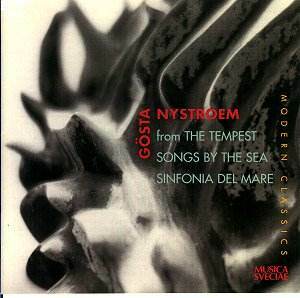 The Third Symphony or the Sinfonia del Mare is perhaps Gösta Nystroem�s greatest work. It was completed in December 1948 at the town of Marstrand where much of the inspiration for The Tempest had been derived. However the Symphony owes less to the North Sea and the Baltic than it does to the beautiful waters around the Isle of Capri. The work lasts some forty minutes and is written in four contrasting movements. Yet the unity is quite definitely the �sea itself.� Every note of this work exudes the atmosphere of the mighty ocean, the Kingdom of Neptune. From the fugal beginnings of the storm in the �scherzo� to the quiet, almost becalmed mood of parts of the final movement we are in the arms of this changeable deity. This is a totally different Sea Symphony to those of Howard Hanson or Ralph Vaughan Williams. The latter is very much about the soul afloat on the heaving bosom of the ocean, the traveller to countries unknown. The former just does not seem to match the promise his earlier Romantic Symphony in its breadth of thought. The construction of this present work is impressive. The opening drum-roll with its �crescendo-diminuendo arc� controls the architecture of each movement and the whole symphony itself. The opening gambit is recalled in the closing pages. While formally speaking this is not truly cyclical, it certainly is internally consistent and self-referential. Of the wind from the sea. And what lovely music Nystroem gives to both singer and orchestra. It is stunningly beautiful. The work ends with an intense �allegro� which is quite definitely storm-orientated. Yet even here are moments of repose and reflection. The storm must always abate. This is a truly great work and it surprises me that it is not in the public domain. I am aware that this symphony was popular in Sweden. Apparently all the main Scandinavian orchestras added it to their repertoire. It was feted by the reviewers. But somehow it appears to have slipped through the nets this side of the North Sea. In a summing up it seems to me that Gösta Nystroem had managed to fuse two disparate tendencies or trends in music � that of modernism with that of romanticism. He claimed to be an incurable romantic � and this is the general feeling from start to finish of this great symphony. And it would be fair to say it is true of this CD in general. A few details. The sound quality is excellent. The playing of this complex and involved music is enthusiastic and committed and the soloist is an absolute dream! The programme notes are adequate � although a little bit more biographical history would have been helpful. This CD is a must for all lovers of �sea music�. It takes its place in my collection next to Bridge�s The Sea, Britten�s Sea Interludes, William Alwyn�s Magic Island and all the music of Arnold Bax that heaves with the swell of the ocean.